Three teenaged girls from Sadsadan, Bauko, Mt. Province have gone missing and their families are calling for your help. First of all, here's the contact number that you can text or call in the event that you have seen these girls. The number is 0946-4152-134. Or you can immediately report it to the authorities. You can approach the police, barangay officials, anybody who can assist you. Thank you. For the full story behind their disappearance, read it below after the photo. (Text and photo courtesy of Ilam Adi Tan Inayan via Facebook). "This morning one customer came to print this photo. I would like to use the social networking site to ask for your help. According to the mother of Rena, every Saturday and Sunday the three ladies go to Cada, Balili, Mankayan, Benguet to work in one of their relatives' garden and will go home on the afternoon of Sunday for them to prepare for school on Monday. (Note: They are working for them to support their studies. )However, just this Saturday and Sunday (June 28 & 29, 2014), umulan po nang malakas sa kanila kaya the three ladies did not go home. Rena texted her mom to get her bag para diretso na siya sa school (Bansa National High School- Bansa, Bauko, Mt. Province). Pero nagulat po silang lahat dahil wala na 'yong tatlo sa school. Last Monday (June 30, 2014) afternoon, Rena texted her mom with this message: "Mama tumulong kayo man nga agkararag tani haan min amo ti aramiden mi"- Mom please help us pray for we no longer know what we are going to do. Tuesday (July 1, 2014) morning, another text message was received from Rena: "Mama haan mi nga amo daytoy lugar nga ayan mi. "- Mom, we don't know the place where we are. Rena's mom said the text message she received last Monday and Tuesday is Rena's style of texting but the next text messages are now a different style. These three ladies are students of Bansa National High School and residents of Sadsadan, Bauko, Mt. Province. Please share and let's help the family of these three ladies. God Bless." 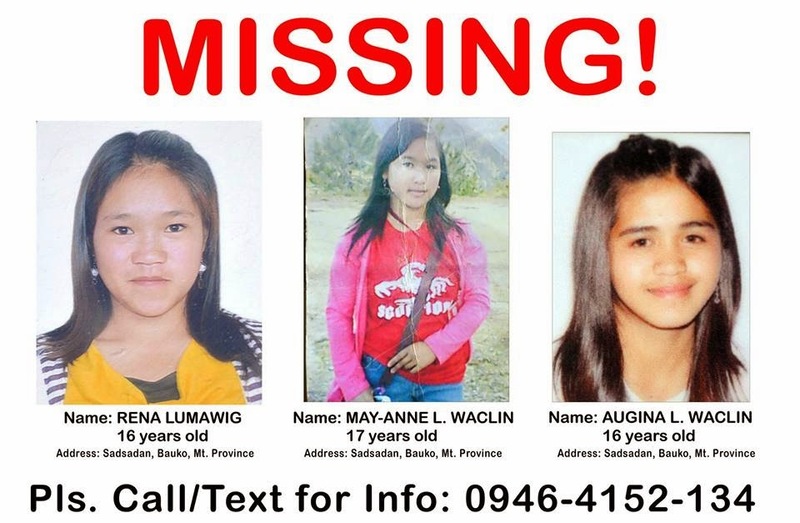 We repeat, the number you can contact in case you saw these ladies is 0946-4152-134. Or you can immediately report it to the authorities. You can approach the police, barangay officials, anybody who can assist you. Thank you.